In aerospace and defense, some of the biggest areas of innovation and investment aren’t on the battlefield, but rather in the electromagnetic spectrum. From electronic countermeasures to electronic counter-countermeasures, techniques for intelligence, surveillance, and reconnaissance systems are evolving quickly. This means engineers’ jobs are ever-evolving and more challenging than ever. System complexity may be increasing, but timelines and budgets certainly aren’t. Yet, underlying technologies are stepping up their game with the ability to design more sophisticated systems more quickly. Figure 1 • AESA Radar Architecture. This technology is important for the evolution of active electronically scanned array (AESA) radar systems. An AESA is a fully active array with hundreds or thousands of antennas, each with its own phase and gain control. Using a phased array of transmitters and receivers, these radar systems steer beams electronically without physically moving the antenna. These types of radar systems are growing in popularity because of their increased power on target, spatial resolution and improved robustness compared with other conventional radars. For example, if one element in the array fails, the radar continues to operate. The increased use of GaN amplifiers in AESA radars should offer better performance, achieving equivalent output power with smaller form factors and requiring less cooling. Another exciting advancement is in converter technology. The latest analog-to-digital converters (ADCs) and digital-to-analog converters (DACs) being released by major semiconductor companies are ultra-fast. This is great news for radar, because the wider bandwidth not only allows for better spatial resolution but also makes it possible to implement some pretty interesting techniques. For example, a radar can hop around to different frequencies to avoid detection or use the same sensor to act as both a communications system and a radar simultaneously. These converters are so fast that it’s actually possible to perform “direct RF sampling,” which simply means sampling so fast that you can acquire RF signals directly without up- or down-converting. For example, the newest FlexRIO transceiver has 12-bit resolution up to 6.4 GS/s. At these rates, it’s possible to directly sample RF input signals up to C-band by moving much of the signal processing to the digital domain. This is also a big deal for AESA radars, because when you’re dealing with thousands of antennas, you can reduce the size and cost significantly by eliminating mixers and local oscillators. 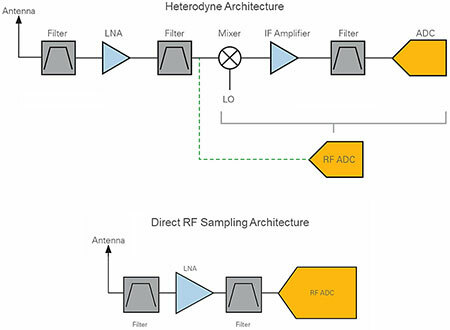 Figure 2 • Heterodyne Versus Direct RF Sampling Architecture. Unsurprisingly, FPGA technology also continues to improve year after year. The computational capability of today’s FPGAs opens the door for innovative techniques that weren’t possible five years ago. For example, engineers are now applying machine learning techniques so that radars are more responsive to their environment. By using machine learning, radars can perform new techniques like automatically recognizing different targets, or adjusting their operating frequency or waveform based on what’s going on around them. In addition, higher level FPGA programming tools like the LabVIEW FPGA Module are becoming more capable, making it easier to port algorithms to FPGAs. This is a game changer for engineers and scientists who don’t have previous hardware description language (HDL) expertise or who have tight timelines. The tight integration between NI hardware and software allows LabVIEW FPGA to go a step further by abstracting the hardware infrastructure, such as PCI Express, memory controllers and clocking. Another key technology that’s paved the way for radar innovation is the evolution toward higher bandwidth data buses such as PCI Express Gen 3 and Xilinx Aurora. Using these buses allows you to aggregate data from multiple sensors for centralized processing. Figure 3 • Machine Learning Techniques Implemented on the FPGA Within Cognitive Radar. In the same way that autonomous vehicles use sensor fusion to aggregate data from sensors like radar and LIDAR, you can use sensor fusion for fighters such as the F-35. Combining the data from radars, electronic countermeasure devices, communications devices and other sensors ultimately provides pilots better situational awareness. With the rapid evolution of these underlying technologies, it’s unsurprising that radar techniques and architectures are also evolving. As technology continues to advance, systems must evolve to keep pace. With both design talent and an intimate knowledge available in-house, developing fully custom hardware and software for radar prototypes and test systems internally can seem like the only viable option to achieve the required customization and performance. However, these solutions also come with long-term maintenance responsibility and opportunity cost. Figure 4 • Aggregating Sensor Data From Multiple ISR Sensors for Centralized Processing Using High-Speed Data Buses. With the advent of the FPGAs and rapid adoption of new converters and streaming technologies in modular form factors, COTS solutions not only meet specification requirements but can offer flexibility to ensure systems achieve the longevity required for longer life cycles. By rapidly incorporating these technologies in modular, COTS form factors, NI enables engineers to meet the evolving requirements of advanced radar systems while also meeting strict timelines and budgets.